Doha, Qatar, April 9, 2019: The free medical check-up organised by QIC Group’s Health & Life insurance entity QLM Life & Medical Insurance Company in celebration of The World Health Day garnered overwhelming success. Initiated now for the third year in a row, both nationals and residents alike benefitted from the free medical checkup services that were made available at various medical centres, clinics and hospitals across Qatar. At Abeer Medical Centers located at Abu Hamour & Industrial Area branches, participants opted for checking Lipid profile i.e. LDL Cholesterol (Bad Cholesterol), HDL Cholesterol (Good Cholesterol), VLDL, Triglycerides, Total Cholesterol, Blood Sugar Fasting, Creatinine - Serum (Kidney Function), ALT (Liver Function Test), Blood Pressure, BMI (Assess Body Fat), Physician Consultation and Dental Consultation. At Allevia Medical Center participants availed free Internal Medicine Consultation, Pediatrics Consultation, Obstetrics & Gynecology Consultation, ENT Consultation, BP, BMI, Blood Sugar, and Total Cholesterol. Whilst at Al Safa Medical Polyclinic participants availed free GP Consultation, Dermatology Consultation, Dental Consultation, Temperature, Pulse, Respiratory Rate, BP, BMI, Blood Sugar, Total Cholesterol (only for above 35 years old), Skin Analysis, PFT, Eye Checkup (Screening), X-ray if advised by the doctor, and 25% discount on Dental procedures. The free medical tests that were available at Asian Medical Center were Internal Medicine Consultation, GP Consultation, Total Cholesterol, Urine Analysis, Random Blood Sugar, Body Mass Index and a 25% discount on follow up services. 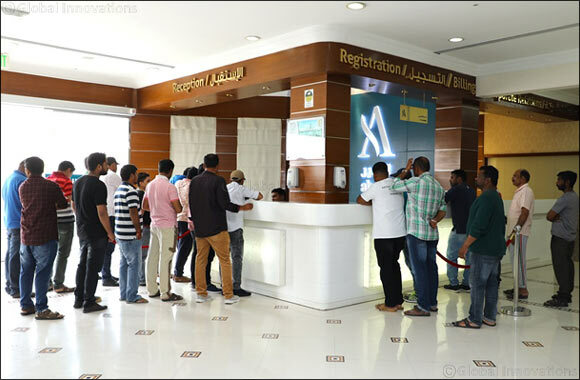 The free medical tests available at New Al Rabeeh Dental Center - Aziziyah Branch were Dental Consultation, X-Ray, 20% Discount on follow up services. At Al Rabeeh Dental Center - Muntazah Branch, participants availed free Dental Consultation, X- Ray and 20% Discount on follow up services. Free medical tests available at Naseem Al Rabeeh - Rayyan Branch were GP Consultation, Ophthalmology Consultation, Dental Consultation, Random Blood Sugar, Cholesterol Checkup, Blood Pressure Analysis, and BMI. The free medical tests available at Naseem Al Rabeeh C – Ring Road branch were Physician Consultation, Physical Exam, Complimentary Cardiology Consultation Voucher, Random Blood Sugar, Vision Test, Hearing Checkup, BMI and 25% Discount on Follow-up Services. At SAC Mall of Qatar, participants availed Dermatology Consultation, Dental Consultation, ENT Consultation, and Consultation for Obstetrics & Gynecology, Pediatric Consultation, Physical Examination, Examine Height, Weight, BMI, Glucose and Cholesterol. At Elaj Medical Centre, participants availed Consultation GP, Consultation Urology, Consultation Physical Medicine, and Consultation Dental, X–ray, Calcium, Chloride, Potassium, Magnesium, Sodium, Phosphorus, CO2, ALP, ALT, Amylase, Creatinine, GGT, Glucose, T3, Urine Analysis, Urea, Albumin, Total Protein. Whilst at Apollo, Atlas Medical Centre Barwa and Future Medical Centre, participants availed BP, BMI, Blood Sugar, CBC (Complete Blood Count), Total Cholesterol, Kidney Function Test, Post-result Consultation with Physician. At Planet Medical Centre, participants availed free Internal Medicine Consultation, Orthopedic Consultation, Endocrinology Consultation, Obstetrics & Gynecology Consultation, and Pediatric Consultation, Ultrasound for Obstetrics & Gynecology, X-ray for any region (if requested by physician), Vital signs (weight, height, pulse, temperature), Blood pressure, Complete blood count (CBC), Creatinine, Urine analysis, Cholesterol, Random Blood Sugar, and 50% discount for any additional services. At Badr Al Samaa participants availed free General Checkup by Doctor, ECG, Chest X-ray, Spirometry, Random Blood Sugar, Total Cholesterol, BMI, Height, Weight, and BP. At Aster Medical Center in C- Ring Road, Hilal, Al Rayyan, Al Ghanim, Industrial Area and Al Khor, participants had access to free GP Consultation (if required), CBC, RBS, Kidney Function Tests (Urea, Creatinine, Uric Acid), Total Cholesterol, BP, BMI, and 50% discount on other services. Rated ‘A/Stable’ by Standard & Poor’s, QLM Life & Medical Insurance differentiates itself from its peers by delivering bespoke and innovative medical insurance solutions with unmatched customer service. Bringing in innovative technologies, QLM Life & Medical Insurance has established itself as a pioneer in the medical insurance sector in Qatar. With a highly experienced in-house team of experts and a wide network of medical service providers, QLM Life & Medical Insurance is well positioned to deliver world class healthcare services to its multicultural client base.